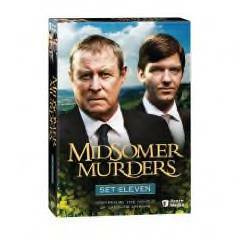 Detective Chief Inspector Tom Barnaby returns accompanied this time by Detective Constable Ben Jones in the pursuit of justice amid the seemingly crime ridden villages of Midsomer County. This English village mystery series just keeps getting better and better. For those fans who didn't like either DS Gavin Troy (Daniel Casey) and/or DS Dan Scott (John Hopkins) Barnaby has a new partner. The match seems to be much better this time around. DC Jones is a local lad who is eager to get on and isn't trying to get out of the county as were Troy and Scott. He understands the ways of the villagers and compliments Barnaby rather than grating on his nerves. That doesn't mean that Jones doesn't have a lot to learn about being a detective. He does. But he is much less abrasive than the two previous partners Barnaby was mentoring. Jones seems eager to learn from Barnaby's considerable experience. Jones was promoted to Acting Detective Constable when DS Scott called in sick and Barnaby arrived on scene without an assistant. Jones was already at the murder scene, working in his normal capacity as a constable. Barnaby asked if he owned a suit and when Jones replied that he did, Barbaby sent him home to change. He has since been promoted to Detective Constable. He is no longer on "acting" status. "The House in the Woods" -- Winyard, an old dilapidated cottage, is rumored to be haunted. Of course that means it attracts all kinds of attention from the locals (especially kids) and several more sinister types. Something is going on there and DCI Barnaby is determined to the discover the real reason everyone is so interested in the place, and why a young couple who were thinking of buying the property wound up dead under unusual circumstances. "Dead Letters" -- In Midsomer Barton, it's Oak Apple Festival week and the mother of a former Oak Apple Festival queen is found drowned. Was it suicide? This episode has a special treat for fans who remember "The Killing at Badger's Drift." "Vixen's Run" -- When Freddy Butler calls his family together -- including his two ex-wives -- for a special announcement then keels over dead after dinner just as he is about to make that announcement, Barnaby can't believe the autopsy finding of "natural death." Freddy had a fortune worth killing for. And what of the missing emeralds? "Down Among the Dead Men" -- a blackmailer gets his comeuppance via a shotgun blast. It turns out the dead man was keeping rather busy. Barnaby has to figure out who was being blackmailed and why before the list of suspects can be narrowed down. If you haven't followed the series, you can start with this set and then go back to the earlier programs. Just remember that this is the third partner Barnaby has worked with. You may or may not like the earlier partners, but the series is worth seeing. This is one series that I don't hesitate to pre-order when the DVD releases are announced.